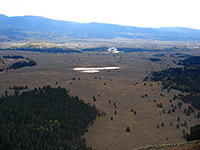 Like the main highway through Grand Teton National Park (US 191/89), Teton Park Road crosses mostly open land covered by grass and sagebrush, but runs much closer to the wooded lower slopes of the mountains. From the park headquarters at Craig Thomas Discovery Center by Moose Junction (see park map), the 21 mile road passes trailheads, picnic areas, scenic pull-outs and several side roads. Just past the center, the Moose-Wilson Road branches off southwards and accesses two trailheads, Death Canyon (at the end of a side road, near Phelps Lake) and Granite Canyon, this latter in the middle of a 1.5 mile unpaved section that is not recommended for RVs. These two are the main gateways into the southern Tetons, and are used mostly by backpackers and climbers rather than day hikers. 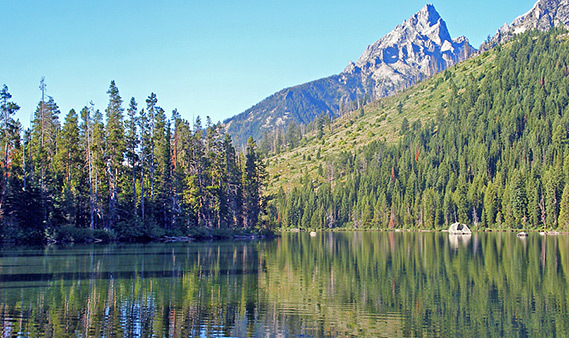 The first trailhead along Teton Park Road is for the paths to two medium sized lakes (Taggart and Bradley), both quite easily reached on a 2 or 3 hour round trip. The nearby River Road forks off to the east and follows the Snake River northwards for about 5 miles, offering a good change of spotting bison and elk, though the route is unpaved, and a 4WD vehicle is generally required. Also along the road are the Potholes, a group of saucer-shaped depressions caused by melting glacial ice. 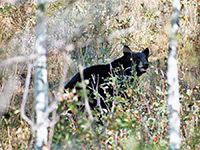 The next turning along Teton Park Road is to Lupine Meadows, via a gravel track that winds across grassland and through patches of trees, also good wildlife habitat, with black bears and moose quite often encountered. 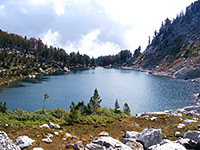 Short paths enter the forest and a longer route climbs nearly 3,000 feet to two very scenic lakes (Surprise and Amphitheater), in the Alpine zone above the treeline. 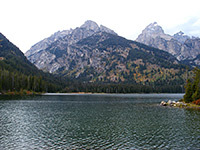 The much larger Jenny Lake (second biggest in the park after Jackson) sits just north of Lupine Meadows, location of another visitor center, plus a trailhead, tent campground and boat dock. A ferry shuttle is operated during summer, transporting hikers to another trailhead on the far side of the lake, used to reach Inspiration Point, Hidden Falls and Cascade Canyon. Boats leave every 15 minutes for the 12 minute journey and cost about $5 per person. Another way to see the lake and the high summits rising above is the partly one way (north to south) Jenny Lake Scenic Drive, a narrow, paved road through the trees that has plenty of places to pull over and walk/picnic by the shoreline. 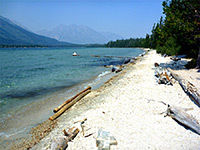 At the north end of the lake, next to Jenny Lake Lodge, is the third major trailhead along the road, for paths to String Lake, Leigh, Bearpaw and Trapper lakes (both relatively short, though the latter has a continuation to Jackson Lake) and the strenuous path along Paintbrush Canyon to 10,720 foot Paintbrush Divide. 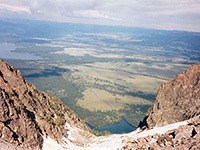 For an off-trail adventure, the slopes west of String Lake, although very steep, can still be climbed by regular hiking, and provide perhaps the quickest route in the park to a high viewpoint; over a distance of just 2 miles the land rises by 3,900 feet, to a narrow ridge between Rockchuck Peak and Mount Saint John. The higher slopes are quite rocky and contain a small glacier, but for a month or two in late summer when the amount of ice is low, the trip is quite possible for fit hikers. From Jenny Lake the main road curves eastwards, passing quite close to the south edge of Jackson Lake though the waters remain out of sight, shielded by a band of trees. Two turnouts provide views of Mount Moran and the Potholes, before the road enters thick forest, growing on the slopes of Signal Mountain - a minor peak but one that affords a fine perspective of the surroundings from two overlooks near the top, reached by quite a narrow (paved) road. The first faces the Tetons, while the second, right at the top, has a larger parking area and gives views north & east over Jackson Lake, the Snake River Valley and the low wooded hills beyond. The summit can also be reached by a 3 mile trail. Teton Park Road has one other turn off, to Signal Mountain Lodge & Campground, scenically positioned beside the lake, then it reaches the lakeshore for the first time, exits the forest and crosses the Snake River via Jackson Lake Dam, joining US 191/89 at Moran Junction. The dam raises the water level of the lake by 33 feet, the excess being used primarily for irrigation by farmers in Idaho.